In May, St. Andrew’s V Former Chaitanya Singhania was invited to participate in the 2011 Telluride Association Summer Program. Chaitanya was one of 64 students selected for the program which features two sites, one at Cornell University and one at the University of Michigan. Just last week, I visited the Telluride House at Cornell upon Chaitanya’s invitation and led a discussion on the academic and cultural realities of public and private school education in the United States. I learned a great deal from my visit. The very concept of the Telluride House and program celebrates the full potential of residential education. Strong, passionate and diverse students enroll in the program—these are young men and women deeply committed to the life of the mind and a full exploration of what living in a diverse and global community might mean. As with all great communities, the students give up, surrender and sacrifice many of the privileges of modern summer life in exchange for the education and experience of a lifetime, an experience that is engaged, passionate, collaborative and thoughtful. The students had lived together for five weeks by the time I arrived at the House, and I immediately sensed deep expressions of respect, friendship and empathy among all members of the community. The students owned the culture, the regulations and the spirit of the House. They meet regularly to assess, improve and strengthen the community; they collaboratively agree on the invitations given to outsiders; they work collaboratively in college-level seminars that teach them the skills of critical thinking, problem solving and argumentation. They are diverse: they come from cities, suburbs and villages; they represent a wide spectrum of public and private schools; they welcome students from across the world to the community. Small Communities – Americans love big schools, big universities, big shopping malls and big cities, but it is important to remember that education can flourish in particularly powerful ways through the creation of small communities, united by intellectual and ethical concerns. The Telluride House comprised a community because it was diverse and small; the community encouraged all students to communicate, contribute and collaborate, and through the experience of living in community, the learning of the program escalated. Student Ownership – If schools treat students as irresponsible and distrusted children, if teachers lecture and read rules and deliver discipline in mindless expressions of power, the culture of a school deteriorates. A great school or great community invites young people to take on adult responsibility and leadership. 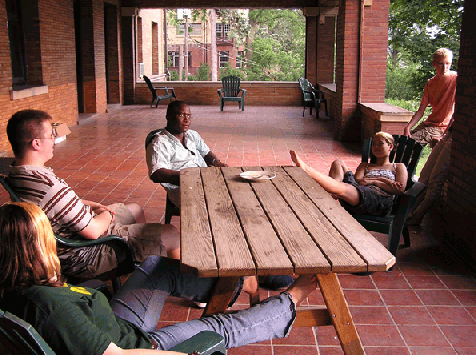 The Telluride House commits itself to important expressions of student care, ownership and stewardship. Diversity – My conversation on American education could only flourish through the perspectives each student offered. We heard from international students who came to America so eager to learn the skills of critical thinking American colleges and universities teach. We heard from public school students who looked for ways to preserve academic programs in the face of budget cuts and institutional failure. We heard from private school students who described their schools as strategic, fiercely competitive and anti-intellectual. My goal in my remarks and conversations with these remarkable students was to encourage them to retain and deepen their authentic love of learning, their deep commitment to the culture of goodness in their schools and their opposition to the forces in society that diminish and destroy the idealism of schools. At its best, private and public education in America can be transformational, inspirational, passionate and collaborative. It can represent a model for the society we hope and wish to be. Impossible? Visit the Telluride House. I’m delighted you enjoyed your visit to TASP. You’re certainly articulating principles near and dear to the heart of Telluride. “Small communities” and “student ownership,” in particular, have been a big part of our pedagogy since our founding in 1911, and in some ways are two sides of one coin for us. Our founder, L.L. Nunn, believed that crucial lessons of citizenship and personal conduct could best be learned in self-governed communities that were small enough for their members to participate directly in the democratic process. That insight played a big part in all of his educational initiatives. Along with our summer programs for high-schoolers, we run residence programs for college students at Cornell and the University of Michigan. I’d be happy to arrange a visit if you ever find yourself in Ithaca or Ann Arbor during the school year.